Looks like Plok has found a Cappy costume. Or maybe it’s just cappy with a Plok costume. This is just great. From now on the stone guys will always remember me of rockyfella. Shorts? Plok can't even wear shorts. I like how you guys make references to other games without forcing it. Every reference fits in perfectly. This was... unexpected. Honestly I thought there rather weren't new episodes to be expected until after New Year. It's hard not to notice the change in art style as compared to volume 5. It seems somewhat of a hybrid between the more free and sketchy art of the earlier volumes and the very precise and polished style of volume 5 (but there's yet some fresh flair to it which wasn't present in either). I suppose the last two covers are merely placeholders? Also, is the title of volume 5 final? To follow the established pattern, it ought to start with the letter 'E' - a personal idea of mine was "Extradited", as that's pretty much what happened to Plok (well, maybe not quite, as technically he was kidnapped by Xobians rather than handed over to System-Z by his home planet, but it seems to fit well nevertheless, as Xobians could insist it was a "valid" extradition from their point of view). >So this is *your* new game? Oh… my god. I never made that connection. Plok is a ghost then? Must be why is is reanimated clothes. According to an old comic book ad, plok was actually made by a vengeful wizard by magically animating his own clothes. The comic ads aren't canon though. The comic ad wasn't even accurate to the plot of the game and the manual, nevermind any of the rest of that. By the way, I just found this on Youtube. Not sure if you both saw it already but it looks really amazing and is such a wonderful throwback to Plok. Cheers. We're definitely continuing the story. Just at the planning stage with volume 6 now. Merry Christmas! I got volumes one and two as gifts. I love all of the behind-the-scenes info, like which strips are your favorites! #75 Ominous has to be in my top ten. So there *is* another hiatus after all. The introduction of the "Shorts Series" raised hopes that the gap beween the regular volumes could be bridged. Aye. Not deliberate. I hoped there'd be no gap too! So I decided to take a look at the Wetrix manual and apparently Wubba's name was/is(?) Derrick? Erm, we definitely didn't forget that. Definitely not. Saw the Japanese Wetrix box with Wubba and all his old friends (whom all seem to have left Wubba behind in Wetrix Land long ago), they look very similar to Japanese Plok. Were they made by the same artist? Good question, not as far as we know. We had nothing at all to do with the Japanese Plok box art. We were never even given a copy of the Japanese release, we only saw it for the first time some years later. Although we did work fairly closely with the Japanese publisher of Wetrix, we didn't have any input into the box art. Two completely different publishers, so it's unlikely to be the same artist, although just about possible. Aqua Aqua's art is credited to Shigenari Douzono, an Imagineer employee. Plok was published in Japan by an Activision subsidiary who only retailed a handful of imported games, so it's likely they'll forever be anonymous. So, will you force Japanese Plok into the comic at some point? Force? I wouldn't put it that way, but we plan for him to appear, definitely. He should be called "Puroku", or "Puruku" since that's how Google Translate translates Plok in Romaji. Also I saw a playthrough of Japanese Plok, and all the text is in Japanese except for the part of the intro where Plok is looking through the telescope and listing all those places of Akryllic looking for that flag, that part was still in English. Was that scene of the game programmed in such a way that they couldn't edit the text? If these comic books ever somehow reaches one million, bring him back for some more chiptune prog rock goodness. pretty sure he doesn't want to, though. 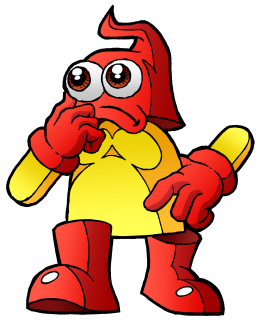 I think the current hiatus could be incorporated into the story: as in "Aliens", Plok falls asleep in his spaceship and he realizes some months have passed whenever he wakes up again. But then I believe you're probably already finished with the planning stages for the next volume. With that said, I'm still excited until Plok's eventual return. With Plok’s 25th anniversary approaching fast, i think the Pickfords are preparing something big. I wonder what it is.. I can’t wait to see how volume 6 will turn out! Finally got my hands on a Plok cartridge after looking for 3 years! Gosh, why is that game so rare im my region? It was 100% worth it, though! Plok's been gone so long now that he'll be indistinguishable from Grandpappy when he gets back.